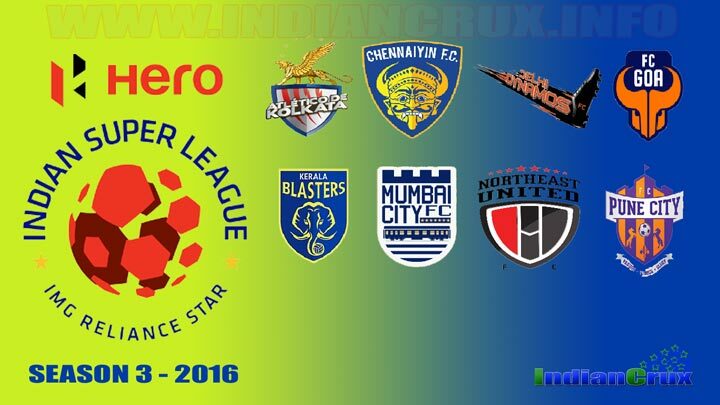 2016 Indian Super League complete match schedule and live results will be here, at www.indiancrux.info. This is the third Edition of the Indian Super League (ISL Season 3) which is the very popular football league in India, founded in 2013. The season will feature with eight teams as usual and playing each team in 14 matches during the regular league matches and four best teams will advance to the semi final. The first match of ISL Season 3 Schedule, held between 1st October and 18th December 2016, is between NorthEast United FC and Kerala Blasters. All the matches of ISL season 3 will be played at 7 pm evening in Indian Standard Time(IST). Competition format of the Indian Super League (ISL) is mainly classified in to two stage, League stage and knock out stage. In league stage, each team will play against other seven teems for twice, as home and away matches. And there are total of 56 matches will play in this Regular season before the top four teams will go in to the semi final. Each wins will give three points and draw matches will give one point. As usual most point scored team will be the top of the point table and four of them will advance to second round. In second stage, That is knock out round, two spelled semi final will play between four paired teams and two of them will advance to second round. Paired team will play the semi final for two times and winner will be the most goal scorers from both two matches. Then as usual, semi final match winners will face at Final match of Indian Super League. 2016 Indian Super League is broadcasting through STAR Sports, As an Official broadcasters. In India, STAR Sports through eight channels and five different languages. This is the first sporting event that making live in more different languages. Before the ISL, Indian TV channels were only sounded English and Hindi for live Sports show. FOX Sports will broadcast in USA and Australia. Europe and South East Asia will be through Eurosport. STAR Gold will broadcast ISL in some region of Europe. Super Sports will broadcast in Africa. The complete schedule of Indian Super League 2016 (Season 3) are announced by the officials, this is not official website, But we providing useful information about Indian Super League Season 3 . Stay tuned with us for live action of biggest soccer carnival of India.